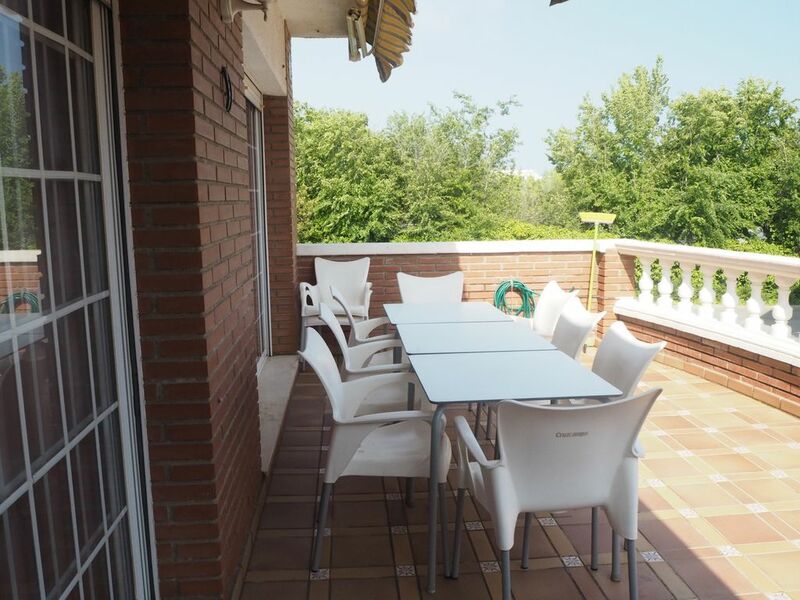 Town house with garden 2 minutes from the center of Poblenou. Impressive house in the village of Pineda de Mar located two blocks from the beach, to enjoy a great and relaxed holiday with family or friends, is a very spacious house and well distributed divided into two floors on the 1st floor found the living room with A large terrace, a large kitchen and a patio with barbecue plus three bedrooms, one of Matrimonio con terrace one two single beds and another with a single bed with terrace which share a very large and beautiful bathroom. On the second floor we find a triple room with a double bed and a single with a large terrace and also found a loft room with two single beds and also share a full bathroom. Very close to Calella and the well-known Church Street with all kinds of shops, bars, restaurants and stores (500m). Heating: Gasoil consumption not included in the price; Approximate consumption of € 3 per hour. Stay less than 5 days: An extra night is paid as a supplement. Tourist tax (obligatory before entering): €0.99 per person and day with a maximum of 7 days. It does not apply to children under 16 years of age. The house is rented entirely to you and is not shared with other people. Pineda de Mar and Calella has a good transport infrastructure, so it is easy to move by bus and train, without being necessary a car. Welsh Airport Line: to travel by bus from the airport to the area. There are also trains to Barcelona and Girona every 30 minutes and from 06:00h to 24:00h. (R-1 or RG-1 RENFE). Calella train station is closer and is 850 meters away, the bus on the N-II road to 700m. Autopista del Maresme C-32; Exit 122: St. Pol de Mar, Calella, Pineda de Mar and Sta. Susanna; We are 60 km from Barcelona and 35 km from Girona. You can park near the apartment, around the building. It is usually only problematic, but not impossible, from July 15 to August 30. Most are free zones, but there is some payment. Pineda de Mar is a quiet seaside village situated in front of the Mediterranean Sea and just behind the green of the Montnegre Natural Park, perfect for mountain excursions. The Maresme's longest beach, with a benign climate and a wide range of accommodation, make Pineda de Mar an ideal destination for an unforgettable holiday. Pineda de Mar enjoys the brand "destination of family tourism" thanks to a wide range of leisure and entertainment for families. From its origins Pineda de Mar has obtained from the land and the sea some products of great gastronomic value (fish, orchard, strawberries,..) that can be tasted in its varied offer of restoration. The main festival of Pineda de Mar is the last week of August, where the final day with fireworks and a correfoc through the streets of the town stand out. Pineda de Mar is an ideal place to spend a wonderful family day or a romantic getaway with a couple. The proximity and good communication with the cities of Barcelona and Girona facilitate your visit with comfort. Link to the website of Pineda de Mar-http://www.pinedademarturisme.com/beaches: large stretches of sand with a nice not very fine sand, ideal for not feeling battered in sand, with an exceptionally transparent water quality and blue flag in all Its beaches. -heading south towards Calella de Mar and from the train station: it has a long and wide beach, with a nice and careful promenade with bars and bar-shops very much appreciated during the day to eat or to have a refreshment, as at night for dinner or to take a restrawberry Sing Mojito. Past the beach of Calella, there is one of the coves or small beaches surrounded by more beautiful rocks of the coast, with a bar called Rocapins, very famous for its food and meals on the beach. They have lounge chairs, and you can taste a bottle of champagne under the umbrella. Past the Rocapins restaurant and behind the last rocks of the beach, towards Sant Pol, there is one of the most beautiful naturist beaches in the area. The promenade is less urbanized but not less beautiful; It is wilder, we personally like it more, with a few bars and a large pines area for picnic or a good nap under one of them. We have the nautical club also with many aquatic activities, and to all this beach area you can also access by car (one of the few beaches with access and free parking, passing under the underground tunnel that there is later of the train station (about 400 m Etros) heading north. A few meters further to Santa Susanna and after the nautical club, almost at the borders of Pineda de Mar with Santa Susanna, we have a perfectly delimited beach for lovers of naturism, also with free parking. Before your arrival: We will send you an email with information on how to get there, maps, tourist information of the area, surroundings, Barcelona and Girona. You will be personally welcomed in the apartment and we will give you the necessary information about the operation of the apartment, our recommendations and curiosities. The normal check-in time will be from 16.00 H to 22.00 H.
until 24:00h. No tickets are allowed in the past hour. If guests arrive before 16:00h, chances are they can leave their suitcases inside the house to start to know their vacation spot. If there was no one before you arrived, you can access it earlier than 16:00h. Departure time will be before 10.00 am, you can negotiate the exit if there are no new customers. • Services included in the price-electricity consumption, free water and gas with a responsible consumption. Bed linen and towels service. Under 25 years old have to communicate before booking, and especially minors. Any claim, disagreement, broken or damaged object must be notified as soon as possible, maximum 24-H after arrival, in order not to have a charge for something damaged or damaged. Have an adequate tone of voice and respect the rest of the other neighbors between 22.00 h until 08:00h the following day. It is forbidden to house or make use of the apartment to persons who are not on the reservation sheet. In the event of a sanction--on the part of the authorities, the non-registered visitor shall assume the cost of the penalty by not communicating his stay in the----apartment. Parties are prohibited in the apartment. Pets are allowed, but they must comply with the rules of the accommodation (after consultation). Towels or sheets, not recoverable by dirt, broken or lost, will be charged at a rate of €5 small towel, €15-large towel and €15 for each top or bottom sheet. If you lose the keys, you have to pay €50. The apartment must be left in the same conditions of order and cleanliness. At the end of your stay, a-----review of the apartment and its belongings will be carried out; Damages or damage caused will be deducted from the bond or--bail, if the damages are higher than the amount of the bail must pay the necessary amount-to replenish the damage caused. For stays of more than 3 weeks check prices (special offers). Please note that we charge for part costs (water, electricity, gas ...). Each month we will provide you with the invoices of the consumptions and you will have to pay it. The amount of the deposit will depend on the duration of the rental.